Throughout the year we’ll be taking on fundraising activities in aid of our charity of the year Leatherhead Youth Project (LYP). This month’s fundraiser has been the tastiest and messiest yet! LYP are a local charity based in Leatherhead, close to Zest headquarters. They provide and incredible variety of services to local children. With one to one mentoring, school help and a local café offering an immeasurable amount of support to children and young adults throughout Leatherhead. 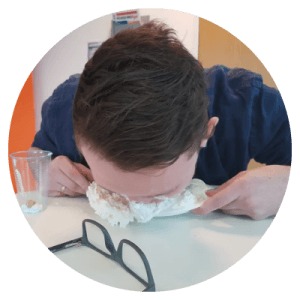 Last week Zest employees took on a series of Man vs Food challenges, hosted by our support and admin teams. We all had a go at flexing our stomach muscles and showing some sheer gut strength. We made delicious milkshakes, ate cream eggs as fast as we could and flipped pancakes into oblivion, allowing our competitive streak to come to the fore. 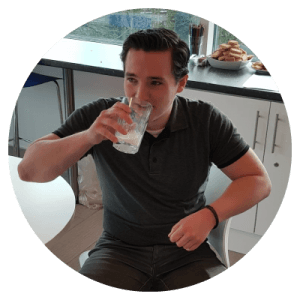 Some employees even dared to take on the highly anticipated chilli challenge. With a lot of gasping and sweating some even made it to the end! 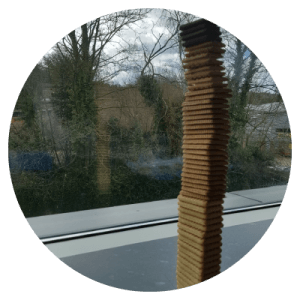 Things got even more heated in the biscuit tower challenge, with Jenny Childs, our Support Team Manager creating an impressive structure, 36cm high. Our Support and Admin teams raised over £160.00 for LYP. We’d like to say a massive thank you to all who participated and made fools of themselves over the two days! If you would like to find out more about LYP check them out here. Or, if you would like to donate towards their amazing efforts you can find their Just Giving page here.